Fifteen years ago today, I met the woman who would become my life partner in a most unexpected place. 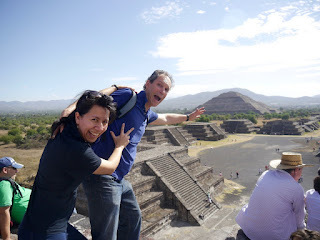 I had just arrived in Mexico City the previous day to travel with a dear friend and colleague, Howard. 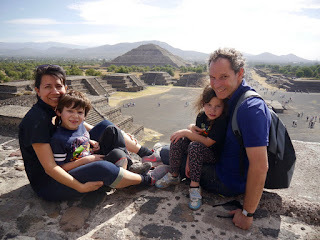 On December 31st, 2000, we visited Teotihuacan, the pyramids just north of Mexico City. After taking a couple funny pictures, we laughed and talked briefly. We learned Angelica from Mexico City was giving a tour to her best friend Bea from Switzerland. We then left. Later, we ran into the two women again in another part of the ruins. When we asked about finding a bus, they suggested they drive us back to Mexico City. As we walked, Angelica asked me about my work. I didn’t want to say “minister” because that’s so often a conversation-stopper. So I said rather quietly, “Ummmm, I lead a church.” She exclaimed, “Oh, you’re a priest!” I tried to explain the difference, but clearly they felt safe with us, two gringoes who are pastors in churches! Her parents didn’t blink that she brought two gringoes into their home. They served us "Ponche," a traditional Mexican holiday beverage made by boiling native fruits. The house was decorated for the holidays. The pots were full of their traditional holiday foods to celebrate New Year’s Eve. Angelica and Beatriz joined us for dinner during which we laughed and laughed and laughed. This day was a fabulous story in and of itself. Two years later we were married on a beach in a small town north of Acapulco. Howard officiated at the service. Bea was a maid of honor. In addition to our families, several friends and colleagues joined us from all over the world. Today Angelica and I have two children, Marco and Erica. Each year we give thanks for the serendipity, grace, and laughter that brought us together. Two days ago, we returned to the very spot we met, this time with our children. When I said, "This is the exact place where your mom and I met fifteen years ago," a man responded, "Wow! You've made my day, my vacation, my year." Others who heard this exclamation gathered around and asked us to tell our story. You never know what might happen if you open to simple, genuine connection when talking to someone unknown to you. Kindness and sharing joy transforms all culture. We are still laughing together with a prayer that 2016 will bring love and peace and joy from unexpected encounters, gestures of kindness, and a willingness to explore and be touched by who we encounter wherever we are. A wonderful story! Knew the outline but not all the details. Happy New Year! Happy New Year, Alan, Angelica and kids! Not only did you have a fabulous day, 15 years ago - you've brought that joy along with you on your path! Thank you for that - a joy to know you, always! This is exactly why I always try to strike up conversations with strangers (in line at the grocery store, sitting on the bus, etc.) You just never know where it will lead. Thank you for this lovely story, and happy anniversary!